. CONTINUATION OF OPENING STATEMENT BY MR. COUGHLAN: . MR. COUGHLAN: The ninth meeting of the GSM Project . Group took place on the 4th September, 1995. In attendance were Mr. Martin Brennan, Mr. Fintan Towey, Ms. Maev Nic Lochlainn, Mr. Nuala Free, Mr. Billy Riordan, Mr. Michael Andersen, Mr. Marius Jacobsen and Mr. Mikel Vinter, Mr. Sean McMahon, Mr. Ed O’Callaghan, Mr. John McQuaid, and Mr. Aidan Ryan. . “The opening, Mr. Brennan outlined the agenda for the meeting. The Andersen presentation on the quantitative evaluation of the 6 applications. Discussions of the forthcoming presentations. The future framework for the project. Under the heading “Quantitative evaluation: . “Prior to presenting the initial draft report of the quantitative evaluation, Mr. Andersen first acknowledged certain shortcomings in the results gleaned so far from the quantitative scoring. The quantitative evaluation had highlighted some incomparable elements. i.e.: . – some applicant had not calculated OECD baskets to their best advantage. – (IIR) had not been calculated in accordance with the tender specification in some cases. – for certain cases not enough information on roaming was supplied to score the application. – Certain of the indicators proved was time sensitive, e.g. if scored in Year 4 they showed one ranking, year 15 giving a completely different view. A1: Score 3.05: Rank 4. A3: Score 3.48: Rank 1. A4: Score 2.96: Rank 5. A5: Score 3.13: Rank 3. A6: Score 3.19: Rank 2.
. On the 7th September, 1995, Mr. Peter O’Donoghue sent a fax to Mr. Michael Walsh. Michael Walsh has already given evidence to this Tribunal and was an executive of IIU Limited, a company of Mr. Dermot Desmond. . The fax reads: “Michael, . “Further to our conversation of this morning the cash requirements for the Communicorp Group to the 31st March 1996 would be in the order of IR£5 million. This does not take into consideration any scale-back of investment or asset disposals that may be required in the event that the First Boston money is not forthcoming.” . On the 11th September, 1995, Mr. Knut Haga of Telenor International wrote to Mr. Denis O’Brien as follows: . “Oslo, 11/9/95. . “Dear Mr. O’Brien, . “As a financial adviser to Digifone and Telenor Invest AS, I would like to raise some of my concerns relating to the content of a letter from Advent International Corporation (AIC) to Mr. Martin J. Brennan dated 10th July 1995.” . That is a letter which was appended to the bid documents which were submitted to the Department on the 4th August, 1995. . He then makes reference to Section 3 of this letter. I have already opened this letter, but the letter is in three sections. One is an introduction to Advent International, and the second is Advent’s investment in the Communicorp Group, and Section 3 is Advent’s commitment to the GSM licence application. . Section 3 reads: . “We have reviewed the business plan prepared by Digifone in connection with its application for the second GSM licence and consider its operation of the second GSM cellular system in Ireland to be an attractive and viable project. The application to you by Communicorp sets out how it is intended to inject new equity into Digifone on the licence being granted to it, and shows that the Advent funds as 5% shareholders participating in the 20 % holding which has been allocated to institutional investors. We are delighted to have the opportunity of investing directly in Digifone as well as our indirect investment in the company through Communicorp and Esat Telecom. . “The said application also shows Communicorp Group remaining as a 40% shareholder in Digifone and being required to provide up to 30 million Irish punts to fund that 40% equity participation. We can confirm that we have offered that amount to Communicorp to enable it to fund its obligations. . “Please do not hesitate to contact Massimo Prelz” – number given – “should you have any queries on the information given in this letter. . “Yours sincerely.” . It is that section of the letter that Mr. Haga made reference to in his letter of the 11th September, 1995. . And he continues: . “Based on the contents of Section 3 in this letter, I have drawn the following conclusions: . “- Advent International Corporation has not committed itself to participate as an equity partner. . – Advent International’s underlying statement is that they regard their position as having an option to participate with a 5% equity stake (without any premium or obligation). . – There has not been made any formal or legal binding agreements between Digifone and AIC (correct me if I am wrong). . “On this basis, I would like to stress that Digifone must not enter into a position where it is obliged to bring in AIC as an equity partner. . “In any case, the terms and conditions for any other equity partner must be based on commercial issues to be determined between Esat and Telenor. . “Based on this fact I would like to stress that Advent’s letter to Mr. Martin Brennan does not add any value to Digifone. Please take this fact into consideration when you are discussing alternative equity partners.” . There was a tenth meeting of the GSM Project Group on the 11th September, 1995, for the purpose of discussing the oral presentations. In attendance were Mr. Martin Brennan, Mr. Fintan Towey, Ms. Maev Nic Lochlainn, Ms. Margaret O’Keefe, Mr. Billy Riordan, Mr. Jimmy McMeel, Mr. Michael Andersen, Mr. Marius Jacobsen, Mr. J. Bruel, Mr. O. Feddersen, Mr. Sean McMahon, Mr. Ed O’Callaghan, Mr. John McQuaid, Mr. Aidan Ryan, Mr. John Breen. . Mr. Brennan outlined the agenda for the meeting, which was to discuss a strategy plan for the presentations. . “Despite the fact that taping of the presentations had been agreed, it was decided that written minutes would also be taken. As it would be impossible for any one person to take the minutes, it was agreed that Ms. Nic Lochlainn and Ms. O’Keefe would record a general resume and that the GSM Project Group Members with technical and financial expertise would record the information that pertained to them. . “Mr. Andersen advised that the opening questions to each applicant should be easy so as to give the presenters a chance to warm up and that they should also be informed that they may have time to confer on questions if the need arose. . “Mr. Towey sought clarification on whether the prices and tariffs quoted in the tenders would be binding in a contract. It was decided that this was the case. . “T&RT had a set of technical questions that they wished to pose to each applicant. Of particular importance was the question of the applicant’s backbone network. . “It was decided to ask the applicants questions on their mandatory tables and their business plans, as there appeared to be many discrepancies between these two. . “As a general rule it was decided that applicants would be given a last opportunity to provide clarification orally at these meetings. Further contact would be avoided. If it became apparent that clarification was essential after the meetings, contact would be initiated in writing by the Department. The applicants were to be informed in this regard.” . On the 12th September 1995 the Esat Digifone consortium made an oral presentation, but before I come to deal with that, perhaps I should say that at this stage, it appears from the documents which I have referred to, and from the information furnished to the Tribunal by Mr. Dermot Desmond and Mr. Denis O’Brien to which I have referred, that the position as of the 12th September, 1995, appears to be: . 1. That on the 12th July, 1995, Mr. Denis O’Brien and Communicorp Group had entered into an agreement with Advent International, and it appears that this was known to Mr. Denis O’Brien. . 2. That agreement entitled Advent International to a 5 percent shareholding in Esat Digifone in return for a letter of comfort addressed to the Department and a letter of comfort addressed to Telenor in terms acceptable to Telenor, and it appears that this was known to Mr. Denis O’Brien. . 3. Mr. John Callaghan recorded that this letter would be under the heading “Advent to give letter to satisfy Telenor and requirements of GSM bid”, and under that: “Strong letter but cannot be a ‘commitment’ to invest.” . Under that, “Advent to have opportunity to participate in our financing arrangements for Group and/or GSM company if money is raised directly for GSM company.” . I actually went through the whole of this document yesterday, and it appears that this was known to Mr. Denis O’Brien. . 4. That no letter of comfort had been provided in terms acceptable to Telenor, and it appears that that was known to Mr. Denis O’Brien. . 5. That Communicorp had no entitlement to £30 million funding from Advent or, to the best of Tribunal’s knowledge, from any other source, and it appears that that was known to Mr. Denis O’Brien. . 6. Communicorp had opened negotiations with Credit Suisse First Boston, a US merchant bank, with a view to raising funds by a bond issue, and it appears that that was known to Mr. Denis O’Brien. . 7. Mr. Denis O’Brien had been engaged in negotiations since the 10th August, 1995, with Mr. Dermot Desmond with a view to substituting Mr. Dermot Desmond for the institutional investors named in the bid, and with a view to seeking from Mr. Dermot Desmond funding support for Communicorp, and it appears that was known to Mr. Denis O’Brien. . 8. Communicorp’s finances were in such a poor state that that it resorted to accepting a loan from Advent at a cost of 30 percent per annum whether or not the loan was cleared off within the year, and it appears that that was known to Mr. Denis O’Brien. . 9. Communicorp had not provided Telenor with a guarantee for £5 million plus a guarantee for half the licence fee required under the joint venture agreement between Communicorp and Telenor, and it appears that that was known to Mr. Denis O’Brien. . 10. Mr. Owen O’Connell was unable to provide an opinion to Telenor that Communicorp had a right to funding for £30 million from Advent, and it appears that that was known to Mr. Denis O’Brien. . Again, from the documents which I have referred to, it appears: . That Telenor had concerns about Communicorp’s financing. That Telenor knew that the letter of comfort furnished by Advent was not acceptable to them. That Telenor knew the stronger letter of comfort they had sought had not been forthcoming. That Telenor knew that Owen O’Connell of William Fry Solicitors did not provide them with an opinion that Communicorp had a right to funding of £30 million from Advent. That Telenor knew that Communicorp had not provided a guarantee of £5 million plus a guarantee for half of the licence fee as required under the terms of their joint venture agreement. That Telenor knew that Mr. O’Connell’s letter of the 17th August, 1995, that Communicorp were seeking alternative source of funding. Discussion of the morning’s presentation by A4. Decide how to progress the evaluation further. “Mr. Andersen spoke about the success of the presentations generally. He felt that because AMI were well prepared from the earlier quantitative assessments, they had attained the required information from all the applicants. The presentations had served to highlight considerable variation between the applicants. . “The A4 presentation was good. But AMI felt that the lack of familiarity with the Irish scene was poor. It was generally evident that: . – A4 spent too much time on matters that were not relevant to the tender requirements. – The ability of each applicant to work as a team had been highlighted. – All applicants had been treated equally. – The presentations had served to consolidate the initial views on the applications arising from the quantitative assessment. – The importance both of a foreign applicant having a good knowledge of the Irish scene and an Irish applicant having an understanding of the global picture was noted. – Some companies showed that they could take a pro-active role in developing the market where required. Finalise the qualitative scoring and award marks on the dimensions. “The scoring of the marketing, financial and management dimensions would take place in Copenhagen next week. DTEC to appoint the appropriate personnel to attend. AMI would provide the first draft evaluation report on the 3rd October. This would be discussed by the Group on Monday, 9 October. The three DTEC divisions would supply any written comments prior to that meeting. Following that, AMI would produce a second draft report by 17 October. . “Other Issues” . “Mr. Towey reported that the draft licence was being examined by the AG’s office. The licence itself would include conditions for the winning application. AMI would be involved in any negotiation with the successful applicant. . “Mr. Riordan is to do some work on the financial indicators and is to forward material to AMI who would amend their spreadsheets accordingly.” . Mr. Sean McMahon, who attended that meeting, made a note, and his note records: . “Post hoc evaluation. . All members of groups present. 1. Capital funding of some applicants. Martin Brennan short-listing, can we do it now? Michael Andersen: Okay. Two groups, A1, A3, A5. “Irish Cellular” and A2, Cellstar. – 9th October next to meet to consider 11 o’clock. A6: Score 2.91: Rank 2.
. It’s dated 29th September, 1995. Re Esat Digifone Limited (“the Consortium”)..“Dear Denis,.“I am writing to confirm the basis of our agreement with the consortium as consideration for us issuing the attached letter to the Department of Transport, Energy and Communications. Our agreement is based on the attached agreement (the “agreement”) document prepared by William Fry Solicitors but – sorry, I beg your pardon; I am reading the wrong one first.. I should go to the other letter. That’s the side letter.. It’s the letter addressed to Denis O’Brien in Communicorp, and it’s re Esat Digifone..“Dear Denis,.“I am writing to confirm the basis of our agreement with Communicorp Group Limited in consideration for us issuing the attached letter to the consortium and the Department of Transport, Energy and Communications.”.“The definitions in this letter and the letter to the consortium are the same..“1. Communicorp has undertaken to subscribe for 37.5% of the consortium (“the obligation”) on the same terms and pari passu with the placees. IIU Limited has arranged underwriting for the obligation. As consideration for arranging the underwriting, Communicorp will pay to IIU Limited (“the Arranger”) a fee of £219,000..“2. All shares will be subscribed for on an absolutely pari passu basis other than as specifically provided for in the agreement by all members of the consortium..“3. In the event of the bid not being successful, the Placees will pay 25% of the net bid costs, excluding the arrangement fee, of the GSM licence incurred by the Consortium. The aggregate of the bid costs will be a maximum of £1,600,000 and will be independently verified as being properly incurred and paid. The Placees’ obligation in relation to 25% of the net bid cost will be paid after deduction of the underwriting fee..“4. In the event that Communicorp fails to meet the obligation in full and the Arranger or its assignee is called upon to satisfy any of the obligation, the Arranger will procure that for a period of four months Communicorp will have a right to meet the obligation or the balance not satisfied as the case may be paying the amount of the balance of the obligation together with interest at a rate of DIBOR plus 2 percent on the amount of such balance..“5. This letter, together with the attached letter addressed to the consortium and the agreement, represents the full understanding between the parties, and no other commitments exists between the Arranger or the Placees on the one hand and the Consortium or its shareholders on the other hand..“Please sign the enclosed copy of this letter in confirmation of your acceptance of the terms of this arrangement and confirmation of Communicorp’s undertaking to use IIU as its arranger.”. 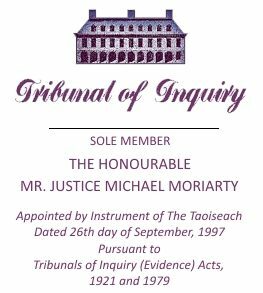 Now, at the same time, there was another letter signed by Michael Walsh – I presume that is Professor Michael Walsh, who wrote to the Department – and Mr. Denis O’Brien.. And it’s addressed to Denis O’Brien at Esat Digifone Limited, and it reads:.“Dear Denis,.“I am writing to confirm the basis of our agreement with the Consortium as consideration for us issuing the attached letter to the Department of Transport, Energy and Communications. Our agreement is based on the attached arrangement agreement (“the Agreement”) document prepared by William Fry Solicitors, but it is subject to this side letter..“1. In the event that the consortium is awarded the second GSM licence, then the Consortium undertakes to place 25% of the equity in the consortium with IIU Limited or its nominees (together “the Placees”). IIU Limited (“the Arranger”) will arrange underwriting for the 37.5% of the equity which Communicorp Group Limited (“Communicorp”) has committed to subscribe for. The maximum combined commitment under the placing and underwriting will be 36.5 million (“the Commitment”)..“2. The Arranger has assigned the agreement in its entirety – both benefits and obligations to Botin (International) Investments Limited..“3. The obligations of the arranger or its assignee under the agreement are conditional on:.“A, the terms of the grant of the GSM licence not being materially different from the requests for proposals in connection therewith from the Department of Transport, Energy and Communications..“B, Communicorp and Telenor having signed a Shareholders’ Agreement to which the Arranger is also named as a party containing protections in favour of the arranger which would be reasonable for a shareholder subscribing for 25 percent of a private company, and .“C, GSM market conditions in the Irish telecommunications industry not being materially disimproved .“in each such case, on or before the date of the first issue under the commitment,.“4. The Placees will be entitled to nominate a representative (“the Placees representative”) to represent their aggregate interest in the consortium, and the Placees Representative will be a party to the Shareholders’ Agreement which will be executed in a form substantially similar to the draft supplied to the Arranger by William Fry Solicitors on September 21, 1995, and the Placees’ representative will be deemed to hold the aggregate of all shares held by the Placees for such purposes..“5. In the event that Telenor fail to fully subscribe for their 37.5% shares in the consortium, then all obligations of the arranger or its assignees or Placees are void save where Telenor and Communicorp collectively subscribe for their 75% share provided; in such instances Telenor will retain 30%..“6. The existing shareholders in the consortium represent and warrant that the consortium will, at the date of the award of the licence, be free of all debt and liabilities other than those bid costs properly incurred. The Placees and arranger will be fully indemnified by Mr. O’Brien and the existing consortium shareholders if this is not the position..“7. The attached letter is strictly private and confidential for the Department to which it is addressed. It may not be used or taken as a commitment for any purpose other than the departmental submission. Mr. O’Brien and Communicorp will fully indemnify the Arranger and the Placee in the event of any cost or obligation or liability arising as a result of the use of this letter or the attached letter for the Department other than for the purpose of submitting the attached letter to the Department to which it is addressed..“8. The terms other than the amount of any tranche of the obligation governed by the agreement will be subject to the prior approval of the arranger..“Please sign the enclosed copy of this letter in confirmation of your acceptance of the terms of this arrangement for a placing and underwriting agreement and in confirmation of the consortium is undertaking to use IIU as its arranger.”. It would appear that on Friday, 29th September 1995, the draft arrangement agreement was faxed to Telenor, and that has been furnished to the Tribunal by Telenor’s internal legal department. Also on the 29th September 1995, the formal arrangement agreement between Esat Digifone and IIU was signed.. Now, there is an undated document which appears in the files of IIU, which appears to be a draft press release indicating the involvement of IIU in Esat Digifone. It would appear that this draft was never issued.. CHAIRMAN: I think you are moving now to a series of recollections of members of the Project Group as supplied to the Tribunal, which perhaps is somewhat separate; and as you have been on your feet for just under two hours, it’s probably appropriate now to defer until eleven o’clock tomorrow morning.. Thank you.. THE TRIBUNAL THEN ADJOURNED UNTIL THE FOLLOWING DAY, FRIDAY, 6TH DECEMBER 2002, AT 11AM. .